Words in Rows: Poetry and Prose is a non-fiction memoir written by Cathy Callen. Callen, a retired educator, has written a history of her family covering two centuries, starting with her family's roots in Switzerland, as well as published scholarly articles in Indiana State Historical Society and the Jackson County, Missouri, Historical Society's journals. Words in Rows is a collection of poems and short non-fiction stories that cover her life from the time she first began writing poetry as a young adult in the 1960s. Callen had volunteered with VISTA and was stationed in Goodnews Bay, a remote Alaskan village with a population of 150 people. She and her VISTA partner, Holly, lived in an un-insulated cabin with waterfront views and no plumbing. The two women would spend their year there interacting with the local children, turning their living room into a public library and experiencing life unencumbered by the trappings and distractions of modern civilization. Callen was most taken with her year there, and, had VISTA allowed it, would gladly have signed up for another year. 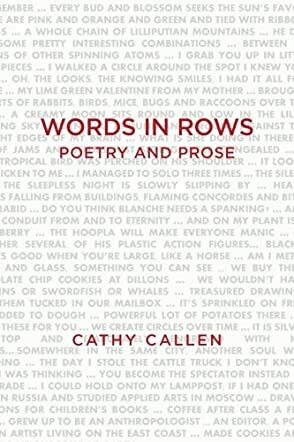 Cathy Callen's non-fiction memoir, Words in Rows: Poetry and Prose, snagged me with her opening poem which begins: "I love you sun/for kissing rainbows into my skin/for kissing flower faces/out of the hills." This taut and elegiac poem captures the absolute delight the poet felt experiencing nature in the wilds of Alaska. Her relationship with nature is sensual and joyous: "Be my lover, sun/Kiss warmth down/onto my cheeks and fingertips/until the wind, jealous/of the lazy smiles you bring to me,/pushes clouds between us/for a moment/And I,/laughing softly,/can lift my fingers to my cheeks/and remember where you've been." Callen's use of personification intensifies that sensuality, making the sun, clouds and wind the actors in her reverie. There's an intensity, a sense of frozen moments in time, that gives this poem a timeless quality and makes it quite powerful. Callen masterfully follows it with her illustration of the tiny cabin and her prose account of that year spent in Goodnews. Words in Rows: Poetry and Prose offers much to the reader; there's often a touch of whimsy and sometimes a hint of regret at times long gone, but the voice of the poet rings clear throughout. It's highly recommended.